The waning days of August can create some of the most intense heat and humidity of the season. Just as we must protect ourselves from certain health concerns in the summer, we must also protect our pets from the potentially harmful effects of soaring temperatures. In these dog days of summer, a healthy pet is a happy pet. Exposure to excessive heat can be detrimental to the health of all pets, but certain pets are more susceptible to the adverse effects of heat. Breeds with short, wide noses (snub noses) such as the bulldog, the Boston terrier, the pug, the Pekingese and the Persian cat are more prone to heat exposure. Obese pets, elderly pets, very young pets, pets that are not acclimated to hot weather, pets with long or heavy coats and pets with cardiovascular or respiratory illnesses are more vulnerable to heat as well. For a cool and healthy pet, always supervise your dog or cat to ensure that he has constant access to shade and shelter. Provide your pet with constant access to clean, fresh water as well. Provide other means of cooling for your pet. If your pet enjoys water, allow him to wade in a shallow pool – as long as you closely supervise him and there is no risk of drowning. 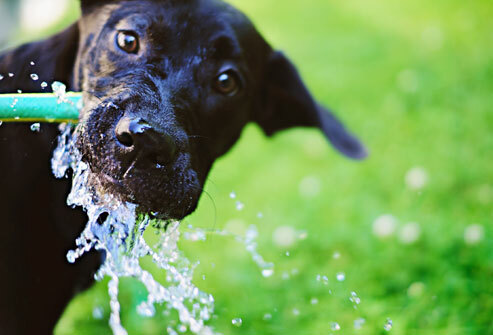 Use a water mister or sprinkler to refresh your pet. Never leave your pet in a confined space with limited ventilation, and never leave your pet in a vehicle. If the ambient temperature is 70 degrees, the temperature in a vehicle can reach 104 degrees in only 30 minutes. If your pet cannot accompany you to your final destination, he will be more comfortable and much safer at home. Use fans to increase air circulation when your pet is in the house. Limit walks and exercise for your pet when temperatures are at their peak, usually between 10 AM and 6 PM. Walk your pet and encourage exercise when temperatures have decreased. Limit the use of muzzles. Pets pant to cool themselves, and muzzles can severely restrict your pet’s ability to pant. If your pet is exhibiting the following symptoms, he may be suffering from heatstroke. If symptoms of heatstroke are present, immediately remove your pet from the heat. Cool your pet with cool – not cold – water and seek veterinary attention at once. If it is not properly treated, heatstroke can cause neurological damage, muscular damage, cardiovascular damage, respiratory distress, liver failure, kidney failure and even death. Maintaining the health of your pet’s paws is important. The pads are the only outlets for your pet’s sweat. In addition, your pet’s paws are suspectible to painful burns during the summer. Check your pet’s pads often for signs of burns. To protect his paws, limit your pet’s exposure to asphalt and concrete in the summer. When the ambient temperature is 77 degrees, asphalt can heat to 125 degrees. At 125 degrees, skin damage can occur within 60 second of exposure. Before you walk your pet on asphalt or concrete, test the temperature by pressing your hand against the surface for seven seconds. If the surface is comfortable for you, it should be comfortable for your pet. However, if your hand is uncomfortable on the surface, you should not walk your pet until temperatures decrease. Or, walk your pet on grass instead. If your pet is properly groomed, its fur will not trap heat but insulate it from hot temperatures and protect its skin from sunburn. Consult your veterinarian or a professional groomer about the grooming requirements for your breed. If your pet has a particularly light coat or if he will be exposed to the sun for a prolonged period of time, consider a pet sunscreen. By applying a pet sunscreen to the nose, the ears and other areas with sparse fur, you can prevent sunburn and even skin cancer. Use only a sunscreen that is specially formulated for animals. There are a variety of pet sunscreens available, but as of now, only Epi-Pet Sun Protector has been approved by the Food and Drug Administration for dogs and horses. Consult your veterinarian for more information on pet sunscreens. ← Water You Going To Do To Conserve?